More and more customers are choosing resin surface solutions from Harbron Home Improvements for a host of outdoor transformation works. As one of the South West’s leading resin specialists, Harbron offers high quality and durable resin products for driveways, walkway and paths, as well as patios, swimming pool surrounds, balconies, steps and wheelchair ramps. But what makes the resin alternative to more traditional gravel and tarmac so good? The first thing to bear in mind is its durability and this is a key selling point of resin. It is ten times more durable than tarmac and all Harbron’s resin surfaces come with a 10 year guarantee. With modern resin technology and the right aftercare, it can last more than 25 years. It’s a surface that won’t crack or chip and there are no unsightly puddles or pooling of water either with a resin bound porous surface. It is stain resistant, non-slip and with its UV protection, won’t fade or discolour over time. It’s very low maintenance too, with just a regular quick jet wash required to keep it clean. With tarmac and gravel, you are limited in colour and design – but not with resin. There is a whole array of both colours and combinations available, so you can truly personalise your project with unique patterns, motifs – and even company/personal logos. It means you can use lighter or stronger colours to create the illusion of space, making your resin drive or patio appear bigger. You can even use colours to divide areas into zones, saving on signage. Why choose Harbron for your resin surface? Well, what started life as a family groundworks specialist has grown into a full-service construction company, offering complete design, installation, repair and maintenance across the widest possible range of home improvement solutions. 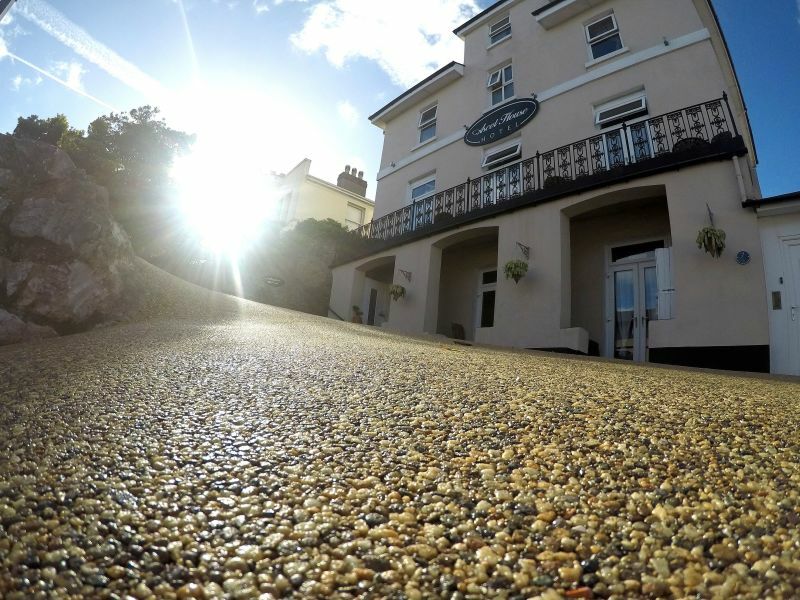 Harbron is a recognised specialist across Devon and Cornwall and into Somerset and Dorset for resin bound driveways, patios, pathways, steps, pool surrounds and balconies. Whatever the job, whatever the size, whatever the surface – Harbron Home Improvements is all about giving your property kerb appeal…and helping you to become the envy of your neighbours!